How Far Along? 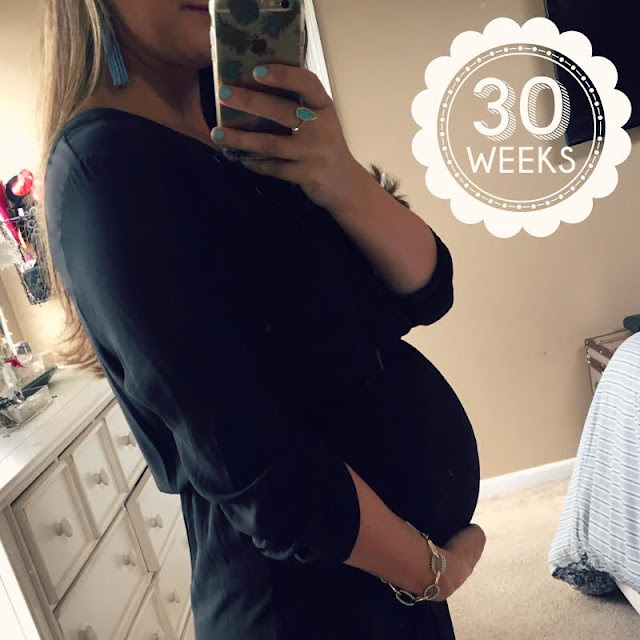 30 weeks, 1 day! 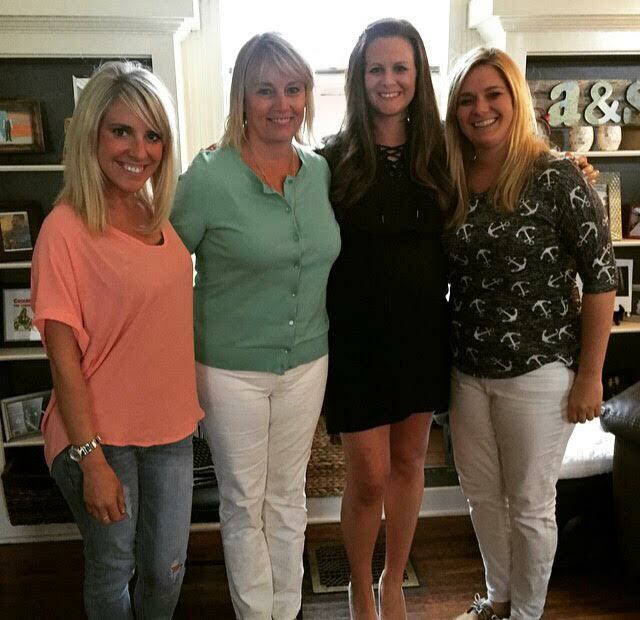 My last bump date was at 23 weeks - a lot has changed since then! I can't believe I'm only 7 weeks away from being full term and will soon have 2 kiddos...insert happy feelings with a side of a slight panic attack. Weight Gain: 17-18 lbs depending on the scale I go by, I can tell baby grew a lot the past few weeks! Maternity Clothes: Just waiting for this weather to be consistently warm so I don't need to squeeze into jeans and pants anymore! Bring on the stretchy maxis! Stretch marks: None yet. I did want to note the linea nigra finally decided to show up. It's a lot lighter this time around than with Cam, but it's there. Symptoms: Acid reflux round 2 - such a joy! It's been pretty bad the past few days. I just went back and read my bumpdate with Camden at this time, and it looks like that's when my acid reflux started with him too! I also have some broken veins in my right leg which looks really pretty when I wear dresses and shorts! Other than that, I feel good and my skin has never been clearer and my hair remains super thick (for both pregnancies actually-huge perks!) Oh, my belly button is definitely in a half popped position. Cam likes to pull up my shirt and poke it and laugh! ha! Cravings: Frozen cold treats of any flavor, please. Gender: Boy! Any guesses on his name? Mood: As it's getting closer and closer to my due date, I've been getting more excited to see Camden as a big brother and to meet this little guy! I'm definitely starting to get a little nervous too, though, about how we will adjust going from 1-2, but I still feel way more relaxed and laid back this pregnancy. Nursery: COMPLETE! Pictures will be up on the blog next week! Movement: Everywhere and all the time! He's pretty active just like his big brother. Sleep: Eh, getting comfortable is more difficult and switching sides is a harder task but once I do fall asleep I sleep really well throughout the night. I go to bed early a lot because I'm trying to get as much sleep as I can before he comes! Looking Forward To: We scheduled a 3D ultrasound next week, so I can't wait to see him and compare his features with Camden's 3D pictures that we had at the same point during my pregnancy with him. Really looking forward to sharing pics of his nursery, too!! Now about my baby sprinkle! 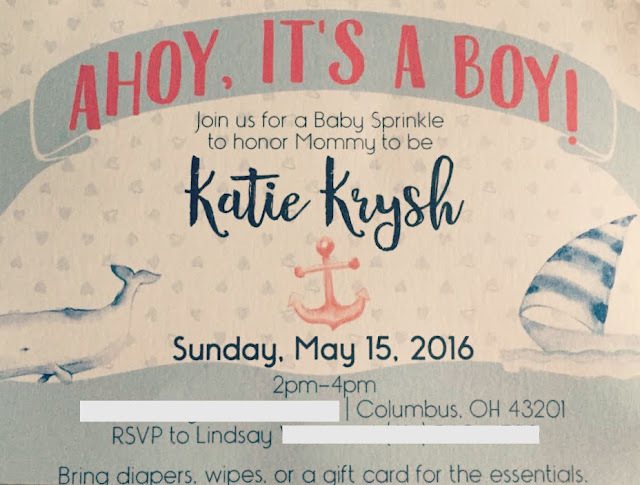 This past Sunday afternoon, two of my girlfriends threw the most generous and adorable nautical themed sprinkle to celebrate baby boy. 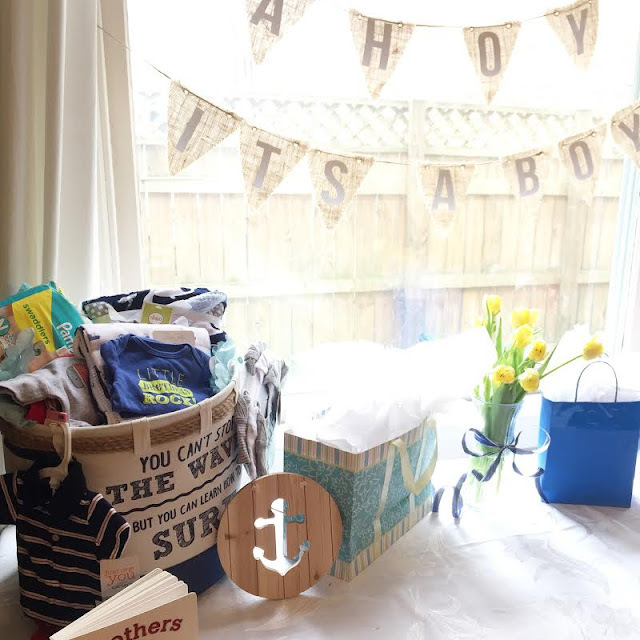 I kept going back and forth about if it was necessary or not, but after my girlfriend Angela offered to host it at her house and we talked about keeping the invite list small (just close friends and family) I got really excited about celebrating baby boy #2! 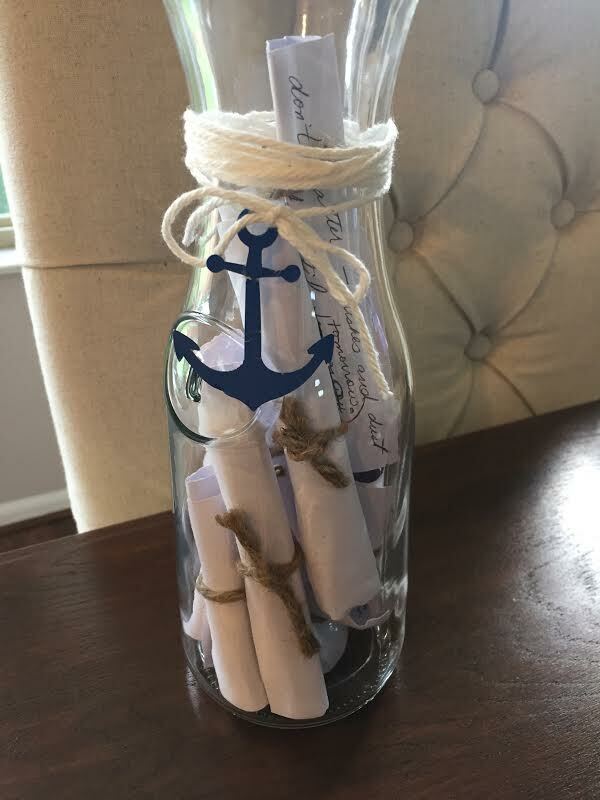 The invitations they sent out were adorable - this picture doesn't really do them justice. In fact, I already have it framed in baby boy's room because it matches his decor perfectly. Since I didn't want people buying off of a registry for us, I love the line they included at the bottom about the gifts. I actually had to cut the last part of that line off to fit in the frame, but it read "Bring diapers, wipes, or a gift card for the essentials. Just little gifts to share in her joy!" 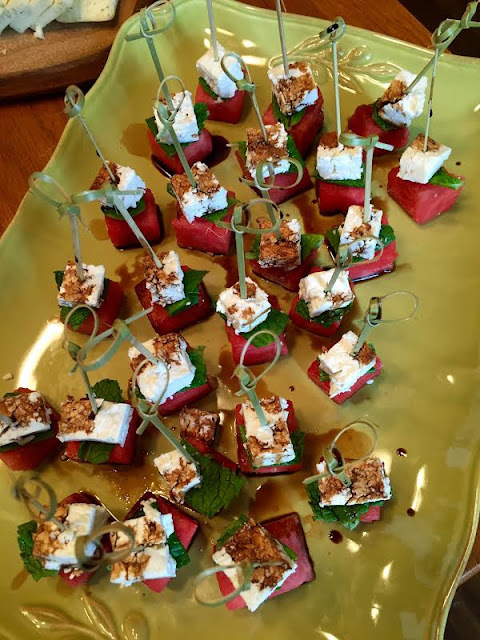 The menu consisted of warm ham and cheese sliders, a ton of bite sized appetizers, veggies, chip dips, crackers and cheese, and so on. We indulged in a half almond, half red velvet cake with ice cream for dessert! Normally I say the food was my favorite part for pretty much every event, but this time just spending the afternoon laughing and listening to a ton of crazy labor stories with my closest friends was by far my favorite part! My mother in law, sister in law, and soon to be sister in law all drove in from Cleveland for it which was so nice of them. 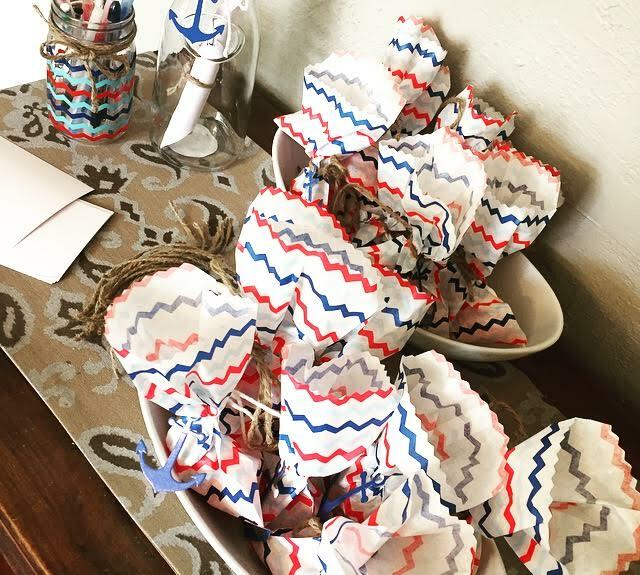 For the favors, they filled these adorable bags with swedish fish (get it?) and attached cute little anchors on them. Another one of my favorite details was the "message in a bottle", where they had everyone write baby (or us) a special note that we can put in his nursery. Camden has a jar with notes from his shower and I still love reading them, so it's really special to me that baby brother has his own notes too! We received some of the cutest summer outfits, generous gift cards to Babies R Us and Target, diapers (so needed since I haven't bought any yet! ), bibs, books, etc. And both sets of our parents gifted us the last of the larger items that we needed...his mattress (thank you parents!) and another camera for the baby monitor (thank you to my in-laws!) So sweet! I didn't take enough pictures as I would have liked, but the whole day was really special and it was really nice to celebrate this baby. I can't wait to introduce him to all the awesome people in our life! And to Lindsay and Angela, you girls are the best. Thank you for always supporting me and for the most perfect baby sprinkle! Such a cute "sprinkle"! I've been following your blog for a while now and you and I were pregnant at the same time LAST go round. My son's name is Cooper and that's going to be my guess for the new little boy! Starts with a C and coordinates nicely with Camden! You look so great! What an adorable sprinkle! You're friends and family are so generous! I'm jealous you are done with the nursery. We still need to buy the crib and mattress...yikes! Oh, and I guess I should start buying nb diapers and wipes! What a cute little celebration! Love the theme! What a cute sprinkle! I love all the details they put into it :) My baby name guess is Aiden or Parker!